This article is about the town and district in Denizli Province, Turkey. For other uses, see Güney (disambiguation). Güney is a town and district of Denizli Province in the inner Aegean region of Turkey. 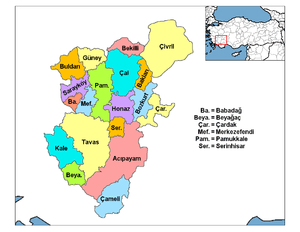 Güney district area neighbors those of four other districts of the same province from east to west, clockwise Buldan, Akköy, Denizli central district and Çal and ranges Eşme district of Uşak Province in the north. Güney district area is located at one of the sources of Büyük Menderes River. Güney town lies at a distance of 70 km (43 mi) north of the province seat of Denizli. It is situated on a steep hillside. Formerly a township depending Çal at first and then Buldan, Güney was made into a district center in 1948. Pamukkale winery has many of its vineyards in Güney. Güney Falls (Güney Şelalesi), at a distance of 3 km (2 mi) from the district center is an important visitor's attraction due to its natural beauty and is a site under official protection. Adıgüzel Dam, also on the River Menderes further up, is between the townships of Güney and Bekilli. Yet another dam in phase of being built is Cindere Dam also on Büyük Menderes River. Güney is famous for its vineyards. They produce one of the best wine grapes in Turkey. It is often labeled as the "Napa Valley" of Turkey. Many of the Turkish wine producers source a sizable portion of their grapes from local farmers in Güney. Wine producer "Pamukkale" has its own vineyards and production center located in this town. Types of grapes commonly grown in Güney include Shiraz, Cabarnet Sauvignon, Merlot, Kalecik Karasi, Cabarnet Blanc and Chardonnay. What makes Güney wine grapes so popular is a combination of climate, altitude and soil properties. Epigraphic and numismatic evidence points at the existence of two ancient cities near Güney; namely Sala and Tralla, possibly constituting a border at one time between Lydia and Phrygia, but their exact sites could not yet be determined with certainty. Falling Rain Genomics, Inc. "Geographical information on Güney, Turkey". Retrieved 2008-10-23. Wikimedia Commons has media related to Güney. This article is issued from Wikipedia - version of the 8/7/2016. The text is available under the Creative Commons Attribution/Share Alike but additional terms may apply for the media files.